For a few years this home served as a home for Janice's son and his roommates, who attended post-secondary at Augustana. When they all finished school and moved away she had to decide: rent, sell or renovate. During the summer previous, Janice had the full exterior redone including the windows. 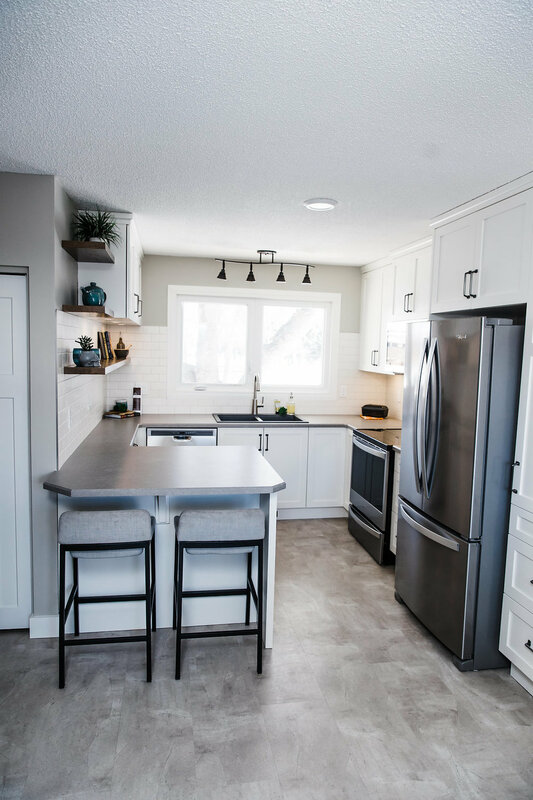 Once the boys moved out it was the kitchen that needed attention, the rest of the home required only a few simple updates such as flooring, paint, new interior doors, baseboard and casing. For the new kitchen layout, the footprint remained very similar but she really wanted the dishwasher directly beside the sink. In order to do this we needed to have a narrower depth cabinet along the adjacent wall. To ensure the narrow countertop remained user-friendly we opted for shorter upper cabinets mounted higher on the wall, added floating shelves and completed the look with dimmable, recessed LED puck lights. Janice wanted a clean, streamlined end product so we used a soft-white shaker door from Lectus Cabinets and took the cabinets right to the ceiling with a small, simple moulding to complete the look. The eating bar seats two nicely and has a set of 3 large drawers on the working side. The tall cabinet to the right of the fridge has great storage with drawers on the bottom half and adjustable shelving above for pantry items. The countertops are Arborite, Inukshuk Grey and resemble concrete. My favorite feature is the warm, oak floating shelves. I also love the height at which we decided to stop the subway tile and that we continued that height on either side of the window!